Oh my goodness! Almond Toffee..... is YUM! When I first received this delectable box, I was really excited. I've had toffee from the grocery before, but that isn't really toffee. Well, not that I've now had Enstrom's Almond Toffee. This toffee is made fresh from dairy products and it just melts in your mouth. It has fresh dairy products like cream and sugar, almonds and has a thin layer of milk chocolate on top. Then, it's dusted with almond powder. It really melts in your mouth and it's so good. My taste buds just exploded with the mixture of chocolate, toffee and almonds - very happy mouth. Although you can break the bark up into good portioned sizes like above, I much prefer to have smaller pieces. It's very rich and decadent. 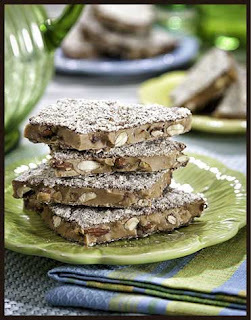 Enstrom's World Famous Almond Toffee is a perfect gift for yourself, for entertaining or for someone else. It's an absolutely delightful gift that comes in dark chocolate, milk chocolate or you can get bars, petites or popcorn! My whole family loves it, so I know I'm going to have get some for their stockings! *USA only - No PO Boxes. This is delivered FEDEX and will require a phone number from the winner. *I received a box of Enstrom Candy to facilitate this review. All opinions are my own. look at all those almonds in that toffee! yum! I am a HUGE lover of Toffee! this is gonna be sooo delicious!!! yummy! Toffee makes my toes curl!